Background: The aerobic capacity of soccer players substantially influences their technical performance and tactical choices. Thus, the assessment of soccer players’ aerobic performance should be of interest for soccer coaches in order to evaluate and improve their endurance training sessions. In this study, we present a new test to assess aerobic performance in soccer by means of a specific dribbling track: the Hoff test. We further determined whether improvement in maximal oxygen uptake was reflected in increased distance covered in the Hoff test. Methods: We tested 18 male soccer players (14 years old) both in the laboratory and using the Hoff test before and after 8 weeks of soccer training. Results: The distance covered in the Hoff test correlated significantly with maximum oxygen uptake, and improved by 9.6% during the 8 week training period, while maximum oxygen uptake and running economy improved by 12 and 10%, respectively. Backward multiple regression showed maximum oxygen uptake to be the main explanatory variable for the distance covered in the Hoff test. Conclusion: The present study demonstrated a significant correlation between laboratory testing of VO2max and performance in the Hoff test. Furthermore, training induced improvements in VO2max were reflected in improved performance in the Hoff test. We suggest that it should be a goal for active U-15 soccer players to cover more than 2100 metres in the Hoff test, as this requires a VO2max of above 200 ml/kg0.75/min, which should serve as a minimum in modern soccer. The positive effects of a high level of aerobic capacity on match play performance in soccer has been indicated for years,1,2 and recently directly shown by Helgerud et al,3 who demonstrated that improved maximum oxygen uptake (VO2max) and running economy, by about 5 ml/kg/min and 7%, respectively, substantially influenced the players’ technical and tactical performance during a game. This included more involvement with the ball, similar technical performance despite significantly higher exercise intensity, increased number of sprints, and a longer distance covered during a game. Thus the players’ aerobic capacity certainly plays an important role in modern soccer and has a major influence on their technical performance and tactical choices. Therefore, the assessment of the soccer player’s aerobic performance could be of interest for soccer coaches in order to evaluate and better programme their endurance training sessions. Aerobic capacity is normally tested in the laboratory using advanced equipment for gas and ventilatory measurements. Such tests are not available to all teams, and several field tests that are supposed to reflect aerobic performance have been proposed.4–7 Recently, Kemi et al7 showed that it is possible to test maximum oxygen uptake in a soccer specific dribbling track using a portable gas analyser. Therefore, dribbling the ball along such a track could be a way of testing and training aerobic capacity. However, it is not known whether distance covered in that test during a limited time course correlates with the players’ VO2max, and if so, how accurate it is in predicting VO2max. Furthermore, it is not known whether a training induced gain in VO2max is reflected in increased distance covered in the soccer specific test. The aim of the present study was to measure maximum oxygen uptake in the laboratory in elite soccer players and determine the relationship to aerobic performance in a new soccer specific ball dribbling field test before and after 8 weeks of soccer training. Eighteen male soccer players (mean (SD) age 14 (0.4) years) volunteered to participate in the study and provided written informed consent in accordance with the Declaration of Helsinki. The university ethics committee approved the study protocol. The subjects could withdraw from the study at any time. The players’ physical characteristics are presented in table 1. Percentage of body fat was calculated according to the formula of Siri based on four skin fold measurements (biceps, triceps, subscapularis, and suprailiac). All the subjects were continuously living in a specialised “centre of excellence’’, belonging to the national soccer federation. The subjects were informed about the test protocols, but not the aim of the study. During the weekends, they participated in the national soccer championship as regular players in their respective club teams. At the time of the experiment, their averaged weekly training programmes included six training sessions per week (each session lasting for about 90 minutes), mainly in soccer training. The experiment was performed just after mid season—that is, 5−8 months after the beginning of the competitive season. The subjects were tested at the laboratory and in field tests, before and after a period of 2 months of training. Each player was instructed and verbally encouraged to give maximum effort at all tests. Laboratory testing occurred at 1400−1700, at a mean (SD) temperature of 19.5 (1)°C, atmospheric pressure of 1019.3 (9.7) mmHg; humidity of 74.5 (3)% (the January tests); and 19.8 (0.5)°C, 1021.8 (1) mmHg, and 69.5 (0.6)% at the post-test (March). The subjects were wearing shorts and running shoes; they abstained from exercise the day before the test and did not drink caffeinated beverages the day of the test. The field test was performed in the same afternoon for all subjects, between 3 and 7 days after the laboratory testing. The Hoff test was performed from 1600 to 1830 in ambient conditions of 15°C, 1017 mmHg, and 87% humidity for the January test, and 20°C, 1021 mmHg, and 75% humidity for the post-test (March). The tests were performed on the same natural grass soccer field and the subjects were wearing soccer specific sportwear. As the pre-test was performed under a light rain, the grass was intentionally wetted prior to the re-test. This test is presented for the first time in the present study. It is performed on a track that was proposed for the first time by Hoff et al13 for training purposes. The Hoff track distances (fig 1) have been modified to reach a total distance of exactly 290 m per tour. As proposed by Hoff et al,13 the player moved a soccer ball through the track by dribbling. The purpose of the test was to cover the maximum distance during a 10 minute period. Each player was informed of the elapsed time at 5 minutes (halfway through the test), and at 9 minutes (when only 1 minute of the test remained). Five subjects were tested at a time. The test starting signal was given for one subject every minute. Thus, the assessor timing the test had 4 minutes for starting the five subjects and then switched to the halfway test signal that occurred in the successive minute for the first player. Then, when the assessor announced the halfway test signal for the fifth player (minute 9), he simultaneously began the last minute signal for the first player. In order to be easily identified, the players wore coloured T shirts that were always assigned in the same order to the players numbered 1 to 5. Four days before the first Hoff test, the subjects performed a pre-test in order to get used to the testing pace so as to obtain maximum performance during the experiment. The player has to conduct the ball in a forward run through the track. The track width is of 35 m, length is 55 m on the right and only 51.5 m on the other side. The distance from cone 7 to the gate 8 is performed with backward dribbling. There are three hurdles (30–35 cm height), 22 cones (two cones for the backward run gate and two for the starting line). Total distance per lap: 290 m; hurdle 3 to cone 1: 30.5 m; distance separating cones 1, 2, 3, 4, 5, 6, and 7: 25.5 m each. The players underwent a period of 8 weeks of regular soccer training during which two sessions per week were included on Tuesday and Wednesday. This training programme was designed in order to improve the player’s endurance. Every Tuesday the training sessions consisted of 4×4 minutes on the Hoff track, separated by 3 minutes of active recovery. Subjects were equipped with cardiofrequency meters (Polar S-610; Polar Electro, Kempele, Finland) in order to measure HR. The training consisted of dribbling the ball along the Hoff track in order to reach 90–95% of individual HRmax during the 4 minute periods and 60–70% HRmax during the active recovery periods. Players were informed of their target HRs and could easily maintain the aforementioned ranges after one or two training sessions. On Wednesdays the players took part in a different training procedure, consisting of 4×4 minutes on a 20 m square in a small group play (4 v 4 players) interspersed with 3 minutes of two players passing and juggling with the ball. The game rules were different each week: two or three maximum touches per player; compulsory pass to a player situated out of the square after five successive passes; no possibility of direct back pass. The main goal was to achieve the maximum number of passes, each five passes being considered as one point. As for the Hoff training sessions, players used HR monitors in order to try to reach the 90–95% HRmax during the 4 minutes of drills. This was not always reached as, depending on the ball loss, some uncontrolled resting periods allowed game intensity decreases. Blood samples were collected 3.5 minutes after VO2max and after the Hoff tests. The 20 μl samples of capillary blood were withdrawn from an earlobe with Microzym micropipettes. They were stored in tubes containing 180 μl of a haemolytic solution to ensure good preservation of the samples at room temperature. Blood lactate concentration was subsequently measured using an enzymatic method (Microzym L; Setric Génie Industriel, Toulouse, France). Values are expressed as means (SD). A Pearson correlation matrix was performed between the variables of the Hoff field and laboratory tests. A backward multiple regression analysis was used when appropriate. A value of p<0.05 was considered statistically significant. During treadmill testing, the oxygen uptake levelled off despite increased running speed. Respiratory exchange ratio was 1.2 (0.3), and blood lactate concentration 9.5 (1.3) mmol/l (that is, the true VO2max was reached). During the last 2 minutes of the Hoff test the HR was <5 beats/min from maximum, and post-test blood lactate concentration was 10.4 (1.6) mmol/l. After training, the distance covered in the Hoff test increased by 9.6% while maximum oxygen uptake increased by 14.5%, 7.5%, and 12% expressed absolutely (l/min), traditionally (ml/kg/min), and appropriately scaled (ml/kg0.75/min), respectively (table 1). Energy cost of running measured at 7 km/h decreased by 14% when expressed in the traditional way (ml/kg/m) and by 10% using appropriate scaling procedures (ml/kg0.75/m). Submaximal HR while running at 7 km/h decreased by 9 beats/min, indicating improved stroke volume. Anaerobic threshold did not change during the experimental period. There were correlations between VO2max (R = 0.68, p<0.01; fig 2), time to exhaustion during the treadmill test (R = 0.71, p<0.01), running economy expressed as ml/kg0.75 lean body mass/min (R = −0.62, p<0.02) and distance covered in the Hoff test. Backward multiple regression showed VO2max to be the main explanatory variable for distance covered in the Hoff test. The regression coefficient (SE) was 5.0 (1.4), p = 0.003; residual SD 3.0, and adjusted R2 = 0.44. 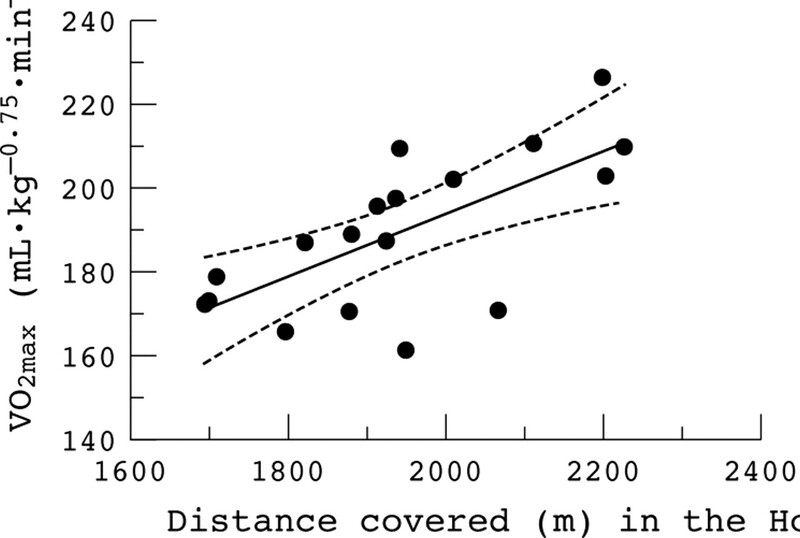 The relationship between distance covered in the Hoff test and maximum oxygen uptake. Data presented are the post-test results, but a similar relationship existed at pre-test. Solid line represents linear regression, dotted lines 95% confidence interval. R = 0.68; p<0.01. This study showed that the Hoff test performance significantly correlated with laboratory measured VO2max and that improvement in VO2max was reflected in improved performance in the Hoff test. The fact that such a ball dribbling field test correlated with aerobic performance is certainly of great interest for the soccer coaches. Indeed, it is generally easier to ask soccer players to make an effort with the ball than without. The performance in the Hoff test was closely related to VO2max during treadmill running, but the relation was not strong enough to directly predict VO2max from the test performance, as expected from previous literature.14 Fig 2 gives examples of performance interpretation. For example, predicting VO2max from running 1900 metres in the Hoff test is meaningless, as values varied between 150 and 210 ml/kg0.75/min. These data suggest that the present test is not greatly different from other indirect tests to predict VO2max; however, the presence of the ball in a dribbling form is certainly a critical motivational point as to its use by soccer teams in order to assess their players’ aerobic performance. Furthermore, fig 2 shows that all players covering more than 2100 metres in the Hoff test had a VO2max >200 ml/kg0.75/min, and those who ran <1900 metres had <200 ml/kg0.75/min, which has been suggested as a minimum value for active soccer players.2 Thus, we suggest that the goal in the Hoff test should be to have U-15 players running a distance of >2100 metres over the 10 minutes of test. This corresponds to 7.25 Hoff track turns—that is, the player has to reach cone 1 after having begun the eighth turn (2112 m). The present study VO2max results for youth players are among the highest ever reported for a youth club soccer team and are in the order of those observed in under 16 national teams.15,16 Furthermore, VO2max was substantially higher than that reported for 8 year old soccer players,17 but are in the normal range of what is reported for senior elite players.2 However, the values are not at all impressive considering the advantages of a high VO2max in modern soccer. A very effective interval training programme, increasing VO2max by about 0.5% each training session, has recently been described,3,13 and was also used twice a week in the present study. Furthermore, as shown by Helgerud et al,3 improving VO2max and running economy by ∼11 and 7% respectively had the consequence that the team in total ran 18 000 metres more at a higher intensity, which also influenced the on field performance, apart from just running.3 The fact that backward multiple regression showed VO2max to be the main explanatory variable for the distance covered in the Hoff test was not surprising, as the Hoff test is mainly covered by aerobic metabolism, also supported by the significant correlation between the two tests. The present gain in work economy and VO2max are substantial, but in line with previous studies in our laboratory.3 The present data also demonstrate how imprecise is the classical approach of expressing oxygen uptake in direct relation to body mass (that is as ml/kg/min) when evaluating changes in aerobic capacity over a period of time in subjects differing in body weight. As can be seen from table 1, running economy expressed traditionally as ml/kg/m was improved by 14%, while expressing oxygen uptake using appropriate scaling procedures as ml/kg0.75/m gives an improvement of about 10%. This gives an excellent example of how imprecise it is to use the traditional expression form because the significant bodyweight gain in the present study automatically gives an improved work economy using the classical approach. This would also have been true even if the weight gain was due only to increased body fat, which, however, was not the case in the present study. The opposite is true for VO2max, as a gain in bodyweight automatically will reduce the VO2max expressed traditionally, regardless of the increased body mass by more fat or muscle hypertrophy. Thus, expressed as ml/kg/min, VO2max increased by 7.5%, while using the correct expression gives a gain of 12%, which makes more sense as the players now have more trained muscle tissue than before the experimental period (with similar body fat). We therefore emphasise the need for using scaling procedures in future studies of soccer players differing in body weight, both for appropriate evaluation of tests and for designing exercise regimens. The present study demonstrated a significant correlation between laboratory testing of VO2max and performance in the Hoff test. Furthermore, improvement in VO2max was reflected in improved performance in the test. We suggest that it should be a goal for active U-15 soccer players to cover more than 2100 metres in the Hoff test as this requires a VO2max of above 200 ml/kg−0.75/min, which should serve as a minimum for modern soccer. However, to precisely measure VO2max accurately, there is no substitute, and probably never will be one, for using gas analysers either in the laboratory or in the field. We would like to thank Drs Z Bartagi and A Khatteli, and coaches F Trigui and W Ben Abderrazak for their valuable help. We also thank H Amri, A Sghaïer, I Ben Ayed, and N Chaouch for their technical support. This study was financially supported by: Ministère de l’Enseignement Supérieur et de la Recherche Scientifique et de la Technologie, Services de la Recherche Scientifique et de la Technologie, Tunisia. Apor P . Successful formulae for fitness training. In: Reilly T, Less A, Davids K, Murphy WJ, eds. Science and football. London: E & FN Spon, 1988:95–107. Wisløff U , Helgerud J, Hoff J. Strength and endurance of elite soccer players. Med Sci Sports Exerc1998;30:462–47. Helgerud J , Engen LC, Wisløff U, et al. Aerobic endurance training improves soccer performance. Med Sci Sports Exerc 2001;33:1925–31. Léger LA, Mercier D, Gadoury C, et al. 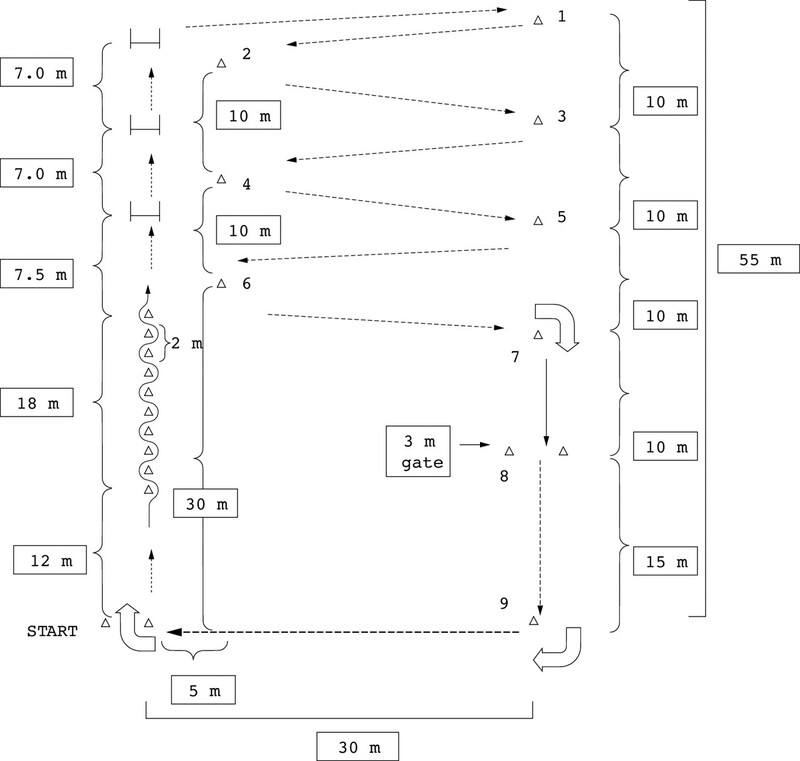 The multistage 20 metre shuttle run test for aerobic fitness. J Sports Sci 1988;6:93–101. Léger L , Boucher R. An indirect continuous running multistage field test: the Université de Montreal track test. Can J Appl Sport Sci 1980;5:77–84. Bangsbo J . The physiology of soccer - with special reference to intense intermittent exercise. Acta Physiol Scand1994a;15 (Suppl 619) :1–156. Kemi OJ, Hoff J, Engen LC, et al. Soccer specific testing of maximal oxygen uptake. J Sports Med Phys Fitness 2003;43:139–44. Whipp BJ, Ward SA, Lamarra N, et al. Parameters of ventilatory and gas exchange dynamics during exercise. J Appl Physiol 1982;52:1506–13. Billat VL, Koralsztein JP. Significance of the velocity at VO2max and time to exhaustion at this velocity. Sports Med 1996;22:90–108. Paavolaïnen L , Häkkinen K, Hämäläinen I, et al. Explosive-strength training improves 5-km running time by improving running economy and muscle power. J Appl Physiol 1999;86:1527–33. Beaver WL, Wasserman K, Whipp BJ. A new method for detecting anaerobic threshold by gas exchange. J Appl Physiol1986;60:2020–7. Bergh U , Sjødin B, Forsberg A, et al. The relationship between body mass and oxygen uptake during running in humans. Med Sci Sports Exerc 1991;23:205–11. Hoff J , Wisløff U, Engen LC, et al. Soccer specific aerobic endurance training. Br J Sports Med 2002;36:218–21. Åstrand PO, Rodahl K. Textbook of work physiology. New York: McGraw-Hill, 2003. Franks AM, Williams AM, Reilly T, et al. Talent identification in elite youth soccer players: Physical and physiological characteristics. Communication to the Fourth World Congress on Science and Football, Sydney. J Sports Sci 1999;17:812. Leatt P , Shephard RJ, Plyley MJ. Specific muscular development in under-18 soccer players. J Sports Sci1987;5:165–75. Bunc V , Psotta R. Physiological profile of very young soccer players. J Sports Med Phys Fitness2001;41:337–41.